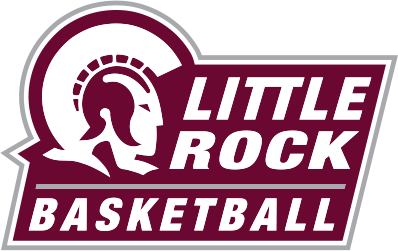 The Jack Stephens Center was rocking last night as Little Rock (LR) honored its seniors in their final home games of the season. LR hosted Appalachian State with the women winning a blowout 61-35 and the men losing 69-67 in a very exciting matchup. The victory gained the women their second consecutive Sun Belt Conference Championship and third in the last four years. The team raised the trophy, while Coach Joe Foley and seniors Monique Townson and Keanna Keys cut down the nets. The women’s game was never close. LR started the game on a 9-0 run and led at the end of the first period 22-6. Their hot shooting continued in the second period as the Trojans took a 36-13 lead into halftime. Freshman guard Tori Lasker had the hot hand in the first half, scoring 10 points on 4-7 shooting (2-3 from 3-pt). LR shot 52% from the field in the first half. LR extended its lead to 30 points going into the fourth quarter and cruised to a 61-35 victory. About midway through the fourth, Townson and Keys came off the floor to a standing ovation, their last time playing in front of the home crowd. The defense was the focal point in this one. The Trojans forced 19 Appalachian State turnovers that led to 21 points and held the Mountaineers to under 30% shooting for the game. Monique Townson displayed her leadership in her final game at the Jack, finishing with 10 points, seven rebounds, four assists, and two steals in a team-high 31 minutes. Keanna Keys contributed seven points, three rebounds, two steals and one block. When asked about how special this conference championship and the overall season was, Keys answered, “It’s real special, being out last year and seeing the girls do it, I was really feeling sick.” “I really didn’t get the feeling of doing it here in the gym,” Keys said. Both Townson and Keys wanted to give a special thank you to all the fans and all the support from the City of Little Rock over their collegiate careers. The two currently have a 45-1 home conference record, a 77-14 conference record, 108-48 overall record, and three regular season championships. The men’s game tipped off with the excitement still flowing in the arena. Both teams shot well from the floor in the first half. The Trojans shot 50% from the field while going 3-5 from beyond the arc. The Mountaineers went 55% from the floor and 57% from three. The teams were tied 33-33 at the half. The game remained close throughout the second half, with neither team gaining more than a six-point lead. At the 1:53 mark, Jaizec Lottie sunk a three-pointer, giving the Trojans a one point, 62-61 lead. Appalachian State answered with a lay-up by Griffin Kinney to take a 63-62 lead. With 30 seconds remaining and LR down by three, a highly contested shot by K.J. Gilmore gave the ball back to the Mountaineers. Good free throw shooting by the Mountaineers sealed the close 69-67 victory. Seniors Brandon Brady and Wadly Mompremier both played outstanding in their final home games at the Jack. Both finished with nine points, respectively. Brady added two assists and a steal, while Mompremier pitched in six boards and a block. Lottie scored a team-high 17 points and was only one rebound away from recording his first career double-double. Both programs have two remaining road conference games at ULM on March 1 and Louisiana-Lafayette on March 3. The men (6-23, 3-13) look to gain some momentum heading into the Sun Belt tourney. The women (18-9, 15-1) look to continue their dominating performance heading into the postseason.